by Joseph Z. Silver, of blessed memory. The amazing story of Mr. Silver’s life, and his pursuit over many decades to discover and document the secrets of Noah’s Ark, are detailed in the manuscript. Mr. Silver was able to determine external and internal dimensions for the Ark, and he developed a consistent and highly probable description for the self-contained ecosystem that Noah constructed. According to this model, the ark was 627 feet long and 104.5 wide, with 65,000 sq. feet of usable room on each floor! This provided enough space to plant and grow crops to feed anywhere from 18,000 to 36,000 young animals. To validate Mr. Silver’s engineering estimates, the manuscript he left was submitted to the naval architecture firm of Shearer and Associates, who evaluated it quantitatively for workability and seaworthiness. Amazingly, they found that Noah’s Ark exceeded the present-day national and international codes for an ocean-going vessel of its class! Scale model of Noah’s Ark and the Washington Monument. Scale drawing of Noah’s Ark in comparison to large modern ships. Subject: Noah’s Ark. References: (a) Your letter received January 10, 2000. I appreciate the opportunity to read and offer comments on Mr. Joe Silver’s manuscript about Noah’s Ark. His research and findings seem quite extensive and well-founded. My profession involves my reviewing acceptability and workability of marine designs developed by my firm as well as others and submission to various regulatory agencies for approval. In this case, I am reviewing the design of a vessel developed by G-d; Who even supersedes the demands of the United States Coast Guard. My concern in reviewing this manuscript was if I found a design flaw, who is at fault? The vessel’s size, according to Mr. Silver, is 627′ long X 104′-6″ wide (beam) X 62′- 8 3/8″ overall depth at the side. (On page 100, he calculates the depth at 62.07′ which is actually 62.70 ft.) The second deck is 20′-10 7/8″ above the lowest deck, the third deck 20′-10 7/8″ above the second and the “roof” 20′-10 7/8″ above the third deck with a one cubit (2′-1″) crown. Based on Mr. Silver’s structural arrangement given on page 113, the ‘tween deck height between the hold and the second deck is about 16’- 4 3/4″; the ‘tween deck height between the second and third decks is about 16’-10 7/8″ and the ‘tween deck height between the third deck and the roof is about 20′- 4 3/4″ at the side. This size makes it one of the larger vessels ever built. The new “VOYAGER OF THE SEAS” built by Kvaerner-Masa Yards in Finland for Royal Caribbean is touted as the World’s largest cruise ship. She is 1021′ long (overall) X 156′ beam X 70′ depth (to the promenade deck). She has a 28′ design draft and can carry 1180 crew and 3840 passengers. The new tanker “ARCO ENDEAVOUR” being built by Litton-Avondale for ARCO is 846′ long X 152′ beam X 83′ depth with an operating draft of 58’. Fig. 1. (a) Computer model of the Ark for the naval engineering computer analysis. Fig. 1. (b) Computer model of Ark for Discovery Channel program on Biblical Technology, 20’04. Figure 2 [not shown] is a plot of the curves of form for the Ark, and Table 1 [not shown] is the hydrostatic tables. The length to depth ratio of the “ARCO ENDEAVOUR” is 10.19:1; the “VOYAGER OF THE SEA” has a length-depth ratio of 14.58; the Ark has a length-depth ratio of 10.01. Mr. Silver addresses the hull strength of the Ark on page 104 by mentioning the cells’ construction, so it appears that longitudinal strength is not a problem. On page 103, Mr. Silver concedes that the entire roof area is made of a transparent material. 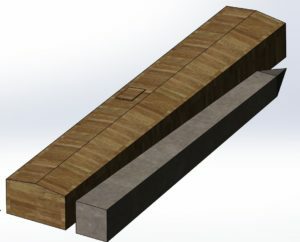 This would indicate that the uppermost deck (the “roof”) is not a structural member contributing to the longitudinal hull girder strength of the vessel. On page 113, he calculates the “roof” weight of wood at 6″ thick which, presumably, accounts for the transparent material. Considering this, the hull depth of the Ark for structural considerations is only twenty cubits (41′- 9 5/8″) which calculates to a length-depth ratio of 15:1 which is still acceptable. As an aside, the American Bureau of Shipping “Rule of Thumb” for ocean-going deck barges is that they should have a length-depth ratio of 15:1 or larger. The Ark can be considered a barge and, therefore, is in compliance with one of the world’s foremost regulatory bodies. With the uniform hydrostatic loading of the Ark and the fact that the “cargo” (the animals) are confined to areas that distribute their load evenly, longitudinal strength is not considered to be a great factor in the design. But, again, the Designer must have transmitted the structural design to Noah and I am not one to question His specifications. Page 101 of Mr. Silver’s manuscript states that the Ark was made of Cypress Wood and weighed (light ship) 14,150.66 long tons (2240 lb/LT). His weight estimate seems to be reasonable as he not only includes the weight of the sides, ends and bottom but internal decks, the roof, bulkheads and longitudinal walls. This internal framing (bulkheads arid longitudinal walls) would contribute to the overall hull girder strength of the Ark. Table 2 [not shown] is the General & Lightship Data for the Ark. The vertical center of gravity of the Ark (centroid of all vertical weights) is assumed to be approximately 50% of the overall depth of the Ark, a conservative estimate. The longitudinal center of gravity (centroid of all longitudinal weights) is assumed to be at the half-length of the Ark (amidships) due to the Ark’s symmetry. Draft Mark locations were included by the software and do not have a bearing on the analysis. Table 3 [not shown] is the Trim & Stability Summary for the Ark in the light ship condition. The Ark has a light ship draft of about 7′- 8 1/2″. I will use Mr. Silver’s estimates for the weights of animals, food, soil, waste and humans on the Ark. However, on day 1, there would be 100% food and crops and practically no waste; on the last day, there would be somewhat less food, but 100% waste. This is true, of course, unless the waste was discharged overboard which would involve a large human effort and an exemption from Coast Guard regulations on discharge of sewage at sea. But, for our conservative estimates, we will analyze the Ark with Mr. Silver’s weights. Table 4 [not shown] is the Miscellaneous Items Data giving the weights and centers of gravity for all of the “cargo.” All items are assumed to be distributed over the entire length of the Ark. The animals are located on the second deck; the soil, food (crops) and human contingent on the third deck; and the waste in the hold. The vertical centers of gravity of the animals and humans are assumed at 5′-0″ above the deck where located. Table 5 [not shown] is the Trim & Stability Summary for the Ark loaded per Table 4 with 18,000 animals. This indicates a loaded draft of about 17′-0″ and a GMt value of 36.694 ft.
Table 6 [not shown] is the Trim & Stability Summary for the Ark loaded with 36,000 animals. 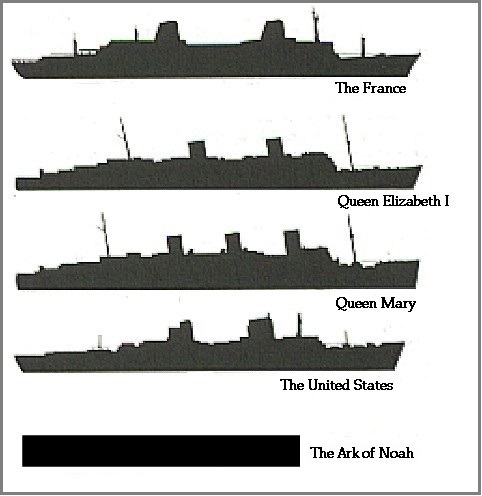 The Ark has a draft of about 20′-6″ which makes the waterline slightly above the second deck and a GMt value of 29.378 ft.. 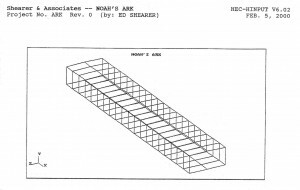 According to Mr. Silver’s sketches, the opening for the loading door is in the side of the Ark at the level of the second deck. As he states on Page 104, the ramp was “pitched” when it was closed making the hull watertight in this area. b = distance in feet from the centerline of the vessel to the geometric center of the passenger deck on one side of the centerline. T = 14 degrees or the angle of heel at which the deck is first immersed whichever is less. N/K is equal to the weight of passengers. For the Ark, GM (req’d) = [(6428.57)(17.417)]/[(31185.39)(0.249)] = 14.42 ft.
GM (actual) = 36.694 ft.
GM (req’d) = [(12857. 14)(17.417)]/[(37613.96)(0.249)] = 23.91 ft.
GM (actual) = 29.378 ft. The actual GMt in both cases exceeds that required and, therefore, the stability of the Ark is acceptable. The Coast Guard also dictates survivability criteria for passenger vessels. Location of watertight bulkheads, quantities and types of damage and resultant minimum drafts and stability have to be evaluated. The Ark has transverse bulkheads as described by Mr. Silver on page 113 and as shown on pages 106 and 107. He makes no mention if these are only structural or if they are watertight. From his description of the feed, air and gas shafts, one can assume that the bulkheads are non-tight as well as the two decks. Therefore, it is my opinion that the Ark had no watertight integrity and, if damaged, would have sunk. However, in the operating environment at that time for the Ark, I would imagine there were very few obstructions and other vessels that could cause damage. Therefore, from the information supplied, it is my opinion that the Ark is structurally sound, and has sufficient stability and buoyancy for the cargo carried. Water-tight integrity is not present, but is not required. But, it was G-d’s design (Contract Plans and Specifications) so I’m sure He incorporated all of the required design features in the vessel. We appreciate the opportunity to review the manuscript and offer our comments. If you have any questions or need further information, please feel free to call.